If you’re like most people, you’ve probably got a few stubborn blackheads that, no matter how hard you try, just won’t seem to disappear. Sure, it’s gross, but let’s admit it: blackheads are satisfying to squeeze. The problem is that they almost always reappear, no matter how much you pop, cleanse, or scrub. But what causes these unsightly spots in the first place? Your hair follicles contain a single hair and a sebaceous gland that produces an oil called sebum. Although this sebum is important to keeping your skin soft and glowing, an excess amount can cause blemishes. Two things can happen when a hair follicle becomes clogged with oil, dead skin cells, and dirt: either the clogged pore expands and keeps the top layer of skin in place, or it expands without the skin, and the air causes it to oxidate and darken. The former is what’s called a whitehead. The latter is the dreaded blackhead, and it can occur anywhere on the body — from the face to the chest, back, arms and shoulders. In order to totally rid your face of these stubborn black spots, you need to create a tailored treatment — pore strips or a blackhead-fighting cleanser, for example — that’s designed specifically for your skin type. Treating excess oil production and penetrating the pores to clear away buildup doesn’t require expensive, brand name products. Here are some DIY skincare treatments that you can try at home today. 2. The tight skin around the nose makes nose blackheads particularly hard to treat or pop. Compared with store-bought pore strips (like your trusty Bioré pore strips and other big brands you can find at the drugstore), these nose strips are more affordable, more natural, and just as effective. We like this gelatin-milk pore strip formula because it’s designed to closely replicate the worthy yet pricey Bioré version, which is made with a sticky polymer that attaches to the top portion of the blackhead and pulls it out. Our recipe uses gelatin instead of polymer for a more natural approach, which may be a better option for those with sensitive or acne-prone skin. With that being said, the recipe is not vegan, since gelatin is made from the cartilage and bones of animals, and you won’t get the same results with a plant-based milk. And of course, you shouldn’t use this mask if you’re allergic to dairy. If you prefer a vegan, non dairy alternative, you might want to try another popular DIY pore strip option made with agar-agar or tea tree essential oil. Mix the gelatin and milk together in a small pot and heat it over low heat for two to three minutes or until the gelatin has completely dissolved. Remove the mixture from the heat and allow it to cool until it’s easy enough to handle, but not cold enough to solidify the gelatin. This is important! Work quickly so that the solution remains at a good consistency for spreading onto the face. Apply a thin layer of the mixture onto your nose, using a plastic spoon to spread it into the corners and edges. Let the mixture sit for about 10 or 15 minutes. There is an amazing variety of pore strip recipes out there. With a simple search on Google, Instagram or Pinterest, you’ll find recipes that use basic skincare ingredients like tea tree oil, honey, essential oil and milk, plus versions that require you to bathe your face in egg yolk, egg whites, flour, and even Elmer’s glue. Just like with any skincare product, you want to choose formulas that are made with safe, gentle and non-comedogenic ingredients. This will help ensure that even those with extremely sensitive skin get good results. If you like the idea of making a DIY version of your favorite product, then you’ll want to expand your repertoire far beyond the homemade nose pore strips to include formulas for removing blackheads on the entire face. A homemade face mask, chemical peel or cleanser may be just what you need to clean pores and get rid of those stubborn black spots for good. Here are five more blackhead-busting DIY skin care hacks you can use to achieve flawless skin. An excellent way to treat your blackheads at home is to create a DIY face mask using honey, lemon and baking soda. These three ingredients are essential for tons of DIY skin care recipes and are much gentler than many found in store-bought products. The honey acts as a natural moisturizer, while the lemon provides a gentle cleanse. But the real MVP of this formula is the baking soda, which acts as a natural exfoliant and totally cleans up clogged pores. All you have to do is mix a half a tablespoon of honey with two teaspoons lemon juice and two teaspoons baking soda, and you’ve got an all-over face mask that’ll do double-duty on those blackheads. Simply mix up the mask and apply it to your face using your hands or a makeup brush. Let it sit for five minutes and then rinse it off with warm water. Let’s face it: nothing quite compares to a good, old-fashioned in-office chemical peel when it comes to busting blackheads. But sometimes you need a more natural, gentle and affordable solution. Enter the homemade chemical peel. The majority of these masks contain aspirin, which delivers an extra dose of salicylic acid to help fight recurring blemishes and blackheads. Most DIY salicylic acid peel recipes require the use of crushed, uncoated aspirin tablets plus natural cleansing, exfoliating and moisturizing ingredients like baking soda, lemon juice and honey. Some may include extras, such as lavender essential oil and other botanical oils, for fragrance. Once you’ve created your mixture, simply apply the peel-off mask all over your face, allow to dry and then peel off. With the peel comes the outermost layer of the skin, including blackheads and free radicals that lead to clogged pores. They say that at-home micro-needling tools look more like torture devices than beauty boosters, but that doesn’t mean they can’t do wonders for your skin. These tiny little skin rollers contain minuscule needles that promise to stimulate collagen and clear away fine lines and wrinkles. For example, the Ora Electric Microneedle Derma Pen has tons of adjustable needle heads that vary in size from 0.25 to 2 millimeters, so they won’t cause pain or puncture the skin. DIY facial scrubs are some of the most popular homemade skin care products, and they’re a great option for clearing away blackheads. Dermatologists recommend occasional exfoliation — once or twice per week for most skin types — to help scrub away the top layer of the skin and thoroughly cleanse the pores. You can keep it super-simple and affordable by mixing lemon juice with sea salt and water. This recipe is particularly effective for those who have excess oil (which leads to the formation of blackheads), as the lemon can help regulate the skin’s natural oil production. Sea salt acts as a natural exfoliator and also helps control oil buildup. There are many homemade facial scrub recipes out there, all of which can be tailored to your skin concerns with various ingredients. For example, you can use a recipe with yogurt to soften and moisturize the skin, or opt for a recipe with honey if you need natural moisture paired with antiseptic and antibacterial qualities. If you’re a regular follower of beauty bloggers, you’re probably familiar with the hype about the Elmer’s glue face mask. But be warned: these masks come with a lot of risks, and can even clog your pores and lead to breakouts. With that being said, charcoal is excellent at penetrating deeply into the pores, and when it’s paired with a sticky gel-like ingredient, it can totally help peel away even the deepest blackheads. You can create a glue-free charcoal mask when you mix up bentonite clay, activated charcoal powder and raw honey. The good news is, this mask means you don’t need to cover your face with school glue to get good results, nor put your skin at risk of breakouts. Note that clay and charcoal masks are not the best options for those with dry and sensitive skin. Oil and blocked pores can do a number on your skin and self-confidence. Luckily, there are a number of easy to use products and tools to help get the clear face you want. The following pore strips and alternatives are among the most effective ways to prevent and treat blackheads. These pore strips use witch hazel extract and dipotassium glycyrrhizate to help remove oil and blackheads. After removing any makeup and washing your face, simply apply the strip to your wet nose. Anjou makes nose strips to target the face and nose separately to assure that you get the targeted treatment that you need. Bioré’s pore strips work to eliminate dirt buildup in just 10 minutes twice per week. This combo pack include specially designed strips to target pores on the nose in addition to face strips that can be used across the face. These popular pore strips are dermatologist tested and hypoallergenic making them perfect for almost everyone. 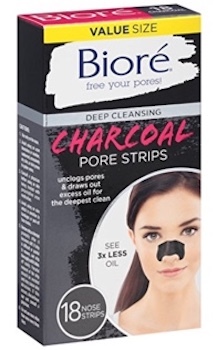 Bioré also offers pore strips enhanced with cleansing natural charcoal. When used once or twice per week for 10 minutes, these pore strips can help unclog pores and revitalize your skin. 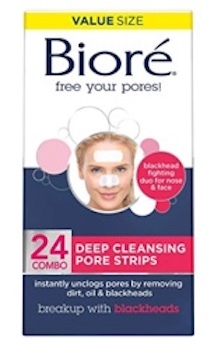 Bioré’s strips draw out oil and deep-down dirt to not only eliminate blackheads, but also help prevent future breakouts. 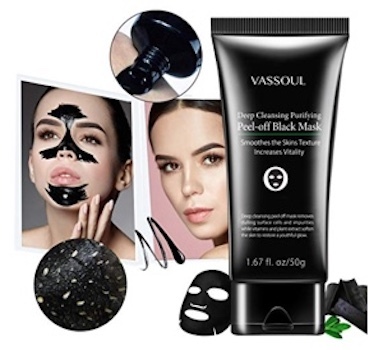 Vassoul mask offers an effective alternative to traditional pore strips. After applying the mask to a clean face, wait for 10 to 15 minutes for it to dry. You will then be able to peel the entire mask off, removing blackheads and oil. This mask also has the added benefit of managing enlarged pore, reducing fine lines, and treating strawberry nose. 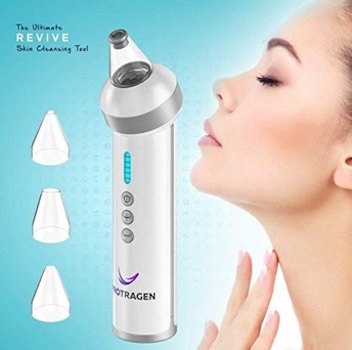 Those looking to bring their blackhead removal to the next level should consider ProTragen’s Revive tool. Using suction, this tool can remove oil to reduce blackheads, acne breakouts, and greasing skin. Revive has six strength setting and for separate suction heads to maximize your comfort and results.